Traditional and herbal healers have used herbs and spices such as turmeric to heal a wide range of mental and physical complaints for thousands of years. According to the University of Maryland Medical Center, turmeric been used for 4,000 years and is still commonly used in Ayurvedic and Chinese traditional medicine. Turmeric may help with the symptoms of certain physical conditions as well as specific mental-health issues, such as depression. You may be familiar with turmeric, also known as curcumin longa, for its culinary uses. Turmeric, a member of the ginger family, is frequently used in Indian cuisine and added to curries for its distinctive yellow color. However, the active ingredient in turmeric, curcumin, is also used for treating a multitude of health conditions. According to the University of Maryland Medical Center, turmeric may be useful for preventing atherosclerosis and alleviating osteoarthritis symptoms. It also may have potential benefits for cancer and diabetes, although further studies are needed. Additionally, curcumin may be useful for alleviating the symptoms of mood disorders, such as depression. Depression isn't simply a matter of feeling down in the dumps or blue -- it is a real medical illness that results in symptoms that can impair your ability to function and impact your quality of life. According to the New York Times Health Guide, depression causes symptoms such as changes in appetite and sleep patterns, feelings of restlessness or irritability, lack of energy, loss of interest in activities you once enjoyed, feelings of hopelessness, inappropriate guilt or worthlessness and, in some cases, suicidal thoughts or gestures. While depression is usually treated with medication and psychotherapy, some people, hoping to avoid medication and its often-unpleasant side effects, seek alternative or holistic methods of healing, such as meditation, biofeedback, yoga, exercise and herbal and dietary supplements. Clinical studies showing the benefits of turmeric for mood and depression have largely been performed on laboratory animals. 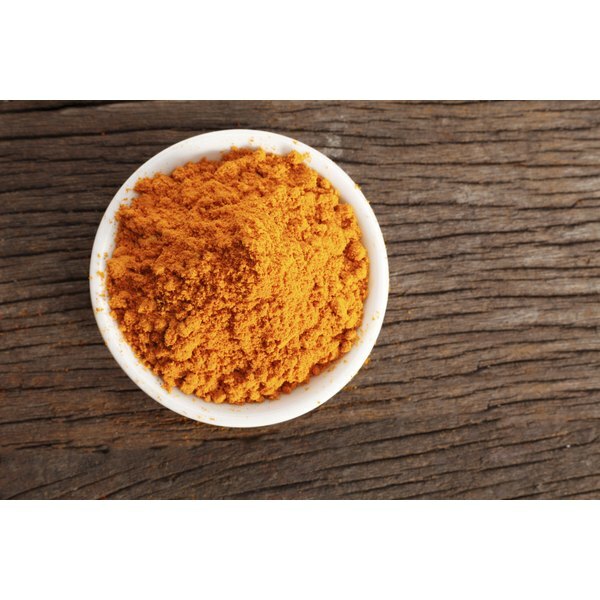 One study, published in the October 2006 issue of the journal, "Brain Research," examined the effects of curcumin administration to laboratory rats after exposure to a chronic stress protocol. The results of the study showed that curcumin supplementation had a beneficial effect on reducing stress-related depressive symptoms. These results may be extrapolated to humans, although further studies are needed. Another study, published in 2008 in the journal "Psychopharmacology," showed that curcumin increased serotonin production and had an antidepressant effect on laboratory mice exposed to several lab tests. A review published in the November 2009 issue of the "Scientific World Journal" hypothesizes that curcumin may provide benefits for depression by assisting with the regulation of brain neurotransmitters like dopamine and serotonin and inhibiting the monoamine oxidase enzyme, which plays a role in breaking down these neurotransmitters. Further studies on human subjects are needed to fully evaluate the benefits of curcumin for depression. Turmeric can be used in powdered, capsule or fluid form. However, turmeric and other dietary supplements are not a cure for depression. If you plan to use a dietary supplement, inform your doctor, especially if you take medication or have a medical condition. According to the University of Maryland Medical Center, turmeric can cause interactions with anti-platelet and anti-coagulant drugs, as well as drugs that are used to treat diabetes and to control stomach acid. If you think you may be suffering from depression, do not attempt to self-diagnose your condition. Consult your doctor or a qualified mental-health practitioner to obtain a diagnosis and to discuss potential treatment options. Brain Research; Curcumin Reverses the Effects of Chronic Stress on Behavior...; Y. Xu et al. Scientific World Journal; Potentials of Curcumin as an Antidepressant; S. Kulkarni et al. Psychopharmacology; Antidepressant Activity of Curcumin...; S. Kulkarni et al.